Question regarding arty stun: Known bug? So I was just wondering if other people have experienced this or if this bug has gone under the radar for now. If no one knows the cause of this issue I will just copy this post into the feedback/bug thread. Edited by somegras, 22 December 2017 - 07:37 PM. Edited by __SLICK__, 11 November 2018 - 11:00 PM. Maybe he used repair/first aid but your side sees full duration of stun so enemy doesn't get to know when they are used ? Nope, all participants (friend and foe) see when a stun ends prematurely. Actually, the replay would have been more relevant. So far I can only say: the second screenshot shows the stun at its last second, so we can't quite say whether it's been a lag issue or a display issue during the replay itself. Since the screenshot shows two fps values you actually do have the replay. Please upload so we can get a better view on the happenings. Everything relevant should be in the screenshots. There is no lag issue if you look at the timestamps in the top right. The stun should end at 8:16, so there should indeed be around 1 second of stun left. Do you get stun assist if the vehicle is already tracked before you stun it ? 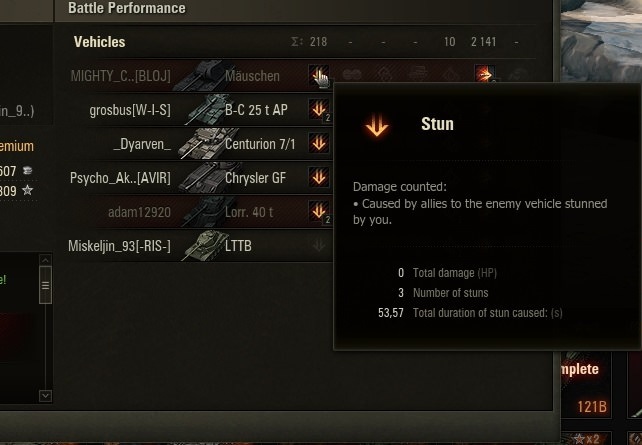 Yes, the stun assist is a seperate value from assist famage earned by spotting or tracking.